Acne is a common problem for many people, and not just teens. If you have ever searched for the perfect skincare system to clear up that breakout, then I have news for you-you can stop looking! Instead of going through untold numbers of various cleansers, lotions, spot treatments, and more, the solution is as easy as blue light therapy-in your own home. Without having to pay ridiculous fees for multiple visits. Sounds too good to be true, right? That's what I thought at first too, until I had the chance to try it for myself! I received a BlueMD Kit for review, which includes the Acne Blue Light Therapy Treatment Lamp, Protective Eye Goggles, and a bonus Clay Mask. Recommended use is 3 20-minute sessions per week, which amounts to 1-hour a week. Anyone can find that kind of time, especially broken up into 20-minute pieces! So, after arrival of the kit, I immediately opened it up to get started. As instructed, I started out by testing my skin's reaction to the light after holding my arm under the lamp for 15 minutes. The next day there was no reaction, so I went ahead with the facial treatment. Wearing the goggles is a MUST, due to the nature of the treatment. You certainly don't want the special blue light shining into your eyes! They're pretty comfortable though, and haven't gotten annoying at all. While 20 minutes may seem like a long period of time to sit or lay in one place, without being able to do anything else, it really isn't bad. Sure, I prefer to read a book when I'm sitting down for 20 minutes, but that's not going to work. However, the results are so worth it! I have been using the BlueMD for close to a month now, and I can see such a difference in my skin. 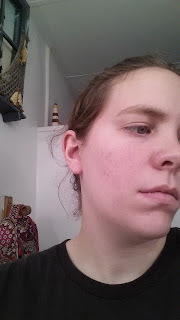 I never really had teen acne, but now that I'm in my mid-twenties, I experienced a pretty bad breakout. With the BlueMD though, I'm seeing the acne disappear, and my skin is starting to look so much better-almost back to normal. Before-and please excuse the odd angle of the picture! Blue Light Therapy works on a simple principle that was discovered by medical researchers in the 1970's. They found that light specifically focused in the 405nm - 420nm wavelength band has the unique ability to kill acne bacterium. These bacteria cannot survive for more than a few minutes when exposed to the correct wavelengths of light. The light causes the bacteria to die, which in turn clears skin. Consistent use of Blue Light Therapy has been proven to decrease the amount of oil on your skin while shrinking pore size. Blue Light Therapy has been used to reduce and eliminate acne breakouts for over 20 years. In a dermatologist's office, this therapy is often quite expensive ($3000-$4000). BlueMD uses the same FDA-approved technology and has created a less expensive home-base acne treatment that is just as effective at a fraction of the price. Trophy Skin uses a proprietary, custom-manufactured bulb that emits the exact spectrum of light needed to kill acne-causing bacteria. And what's more, we can prove it! We can prove that our light contains high intensity, pure blue light and nothing else. Take a look at the graph, showing the wavelength output of the Trophy Skin device tested by an independent source. It really does work, so check it out today!! One of my readers will receive a BlueMD Kit!!! I would like this because I am 45, & am not at all happy with my skin, & hope that it will help clear my skin up some. I would like this for myself and my husband might even try it. I always have a small patch that I would like to clear up. 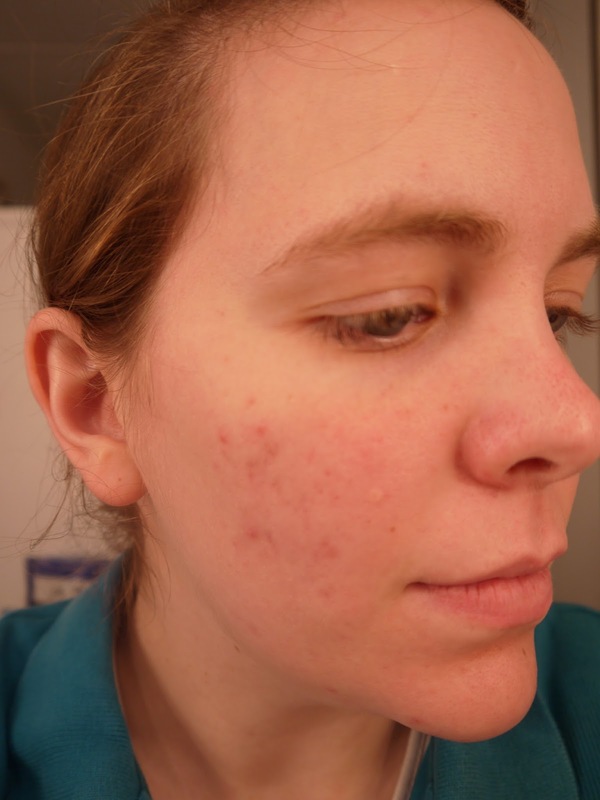 I'm in my 30's and still struggling with acne - I'd love to give this a try to see if it can help me achieve the clear complexion that I've always wanted. I think this might clear up the acne I occassionally get. I want to try it to see if it will help clear my acne. I'm in my 40's and still fight acne breakouts. Looks like this might really help. I would love to let my children try this. They use expensive medication, but this would be definitely worth it to try to see some nice results. I would like to win this for my daughter who fights acne. I entered the Coldstone Creamery. I would love this for both my son or daughter. My daughter has acne and I'd like to win this for her.